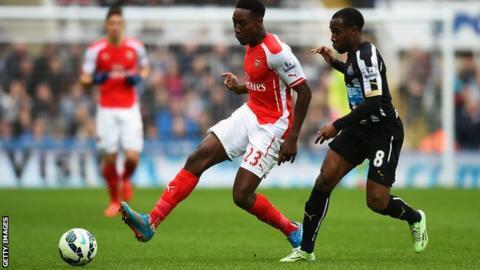 Arsenal striker Danny Welbeck is expected to be out until Christmas after having a knee operation. Welbeck, 24, who had surgery last week on the injury sustained in April, has scored eight goals in his first 34 games for the Gunners. Arsenal, who were linked with Karim Benzema, knew the extent of the problem before the transfer window closed but did not reinforce their attack. That means Olivier Giroud is their only recognised striker fit for selection. Theo Walcott, Alexis Sanchez and Joel Campbell - who has not played for the Gunners since January - have experience of operating in that position, but are mainly used by Arsenal as wide players. England international Welbeck, who joined from Manchester United in 2014, picked up the injury to his left knee after coming on as a substitute in Arsenal's 0-0 home draw with Chelsea in late April. "The injury to his cartilage did not respond as well as hoped and the decision was taken last week for him to undergo surgery," said a statement. Arsenal did explore the possibility of recruiting a new striker before Tuesday's transfer deadline, but they ended the window with goalkeeper Petr Cech as their only signing. They were the only club from the top five European leagues not to sign an outfield player during the summer. That led to the Arsenal Supporters' Trust calling for an inquiry into the club's transfer policy. "No-one wants Arsenal to buy players just for the sake of it, but we do want to see the money being invested to make the club stronger," it said in a statement. Manager Arsene Wenger said: "Am I happy with the investment I make? Yes, every time. You have to find the players to invest in."